GPOD does not grow potatoes; we only size, grade, and ship Idaho’s best fresh potatoes. 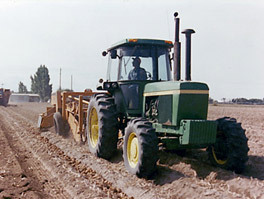 With volcanic-rich and nutrient-filled soil, farmers in Southeast Idaho have the best soil in the world for growing potatoes and are experts in proper watering, fertilizer application, and harvest timing and techniques. Our growers’ expertise, coupled with GPOD’s quality control measures, will always deliver premium Russet Burbanks every time. GPOD of Idaho packs and ships only the highest-quality Russet Burbank variety potato. The Russet Burbank consistently has the highest amounts of solids, making it the best potato on the market. It fries, mashes, and bakes lighter and fluffier than any other potato variety. Our potatoes are planted from certified seed in early May. The Russet Burbank has a minimum growth period of 120 days, when our local farmers work their magic. After the potatoes have fully matured, the grower shreds the vines and lets the potatoes stay in the ground for an additional 21 days to let their protective skins set. After the skins are tested and deemed mature, the harvest begins. Good growers understand that harvest decisions make or break the perfect potato. Growers monitor the temperature, moisture of the soil, depth of the potatoes, and other factors to protect the final produce from blemishes, bruises, or cuts. Once in dark storage and under a carefully controlled environment, Russet Burbanks keep their top quality for up to 11 months. During this storage process, growers pay special attention to temperature and humidity. GPOD begins its first step of packing top quality potatoes when we remove them from growers’ storage. We have our own fleet of trucks and scooping equipment along with properly trained employees who carefully load and transport the potatoes to the GPOD of Idaho facility, where they are washed and graded to meet the highest-quality standards. With the expertise of our committed growers and GPOD’s commitment to quality, we can ensure that only the best Russet Burbank potatoes will be put into your bag or box.